The opposition All Progressives Congress in Bende yesterday suffered another setback when a chieftain and members of the party decamped to the ruling Peoples Democratic Party, PDP during a Rally in Bende community. The former APC leader stated that they had come to work for Dr Chima Anyaso’s Victory. The decampees led by Elder Jerome Okorie a ranking member of Ben Kalu’s campaign organization admitted that they had to join the winning team in other to bring development to Bende community. He Stated that from all indications Dr Anyaso is the favored candidate in the House of Representatives race for Bende Federal constituency And therefore it would be a futile effort on their part to toil in vain for the APC which he described as a failed project. The rally which held in the home town of the APC candidate and attracted a large crowd of supporters, was in consonance with the ward tour campaign of the PDP. Speaking at the rally, the man of the moment Dr Chimaobi Desmond Anyaso challenged the people of Bende to vote PDP as appreciation for all the benefits they had reaped from successive PDP governments. He reminded them that PDP had given their son Ben Kalu the opportunity to lead when he was made TC Chairman and he failed woefully, leaving nothing to be remembered for. Dr Anyaso insisted that his opponent did not mean well for his people in Bende. reminding them that it took he Dr Chima Anyaso’s intervention to restore their electricity in Bende town after almost 6 months in darkness and instead of support, his opponent sent thugs to go and disrupt the power reinstallation project which by the grace of God is nearing completion today. Dr Anyaso assured the people of world class performance when he assumes office. He also promised them that he would never let them down if they vote him. He implored them to vote Dr Okezie Ikpeazu and Senator Mao Ohuabunwa assuring them that voting PDP all the way will bring unparalleled development to their community where even their own son could not do any tangible project when he had the opportunity. Other notable PDP stalwarts who spoke at the event also spoke in line with Dr Chima Anyaso’s submission and encouraged the people to see PDP as the only party which could guarantee their safety and attract development to the people. 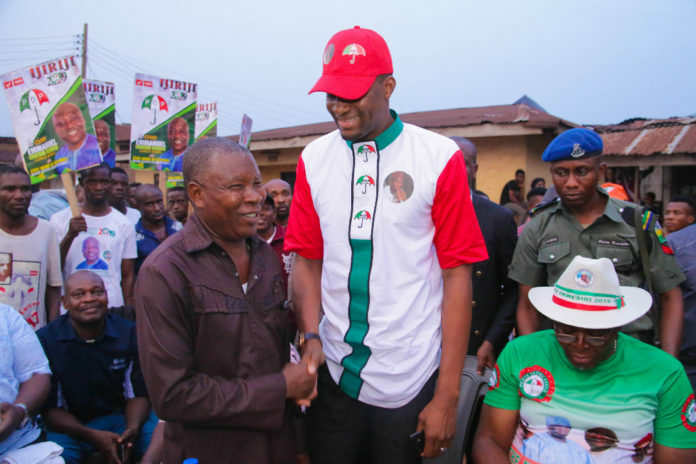 The deputy speaker Of Abia State House of Assembly Dr Cosmos Ndukwe pleaded with residents of Bende community to come out enmass on Election Day and vote PDP from presidential elections to Senate, to House of Representatives, governorship and state house of assembly. He said that the level of insensitivity that the APC Government has exhibited shows that it doesn’t mean well for Ndigbo therefore the thought of supporting or voting them should jettisoned and abandoned at the polls. They shared campaign materials and gift items to people who attended the rally and thanked them for coming out in large numbers to support the PDP.